CSS is an inseparable part of front-end designers and developers, probably because it’s the only real option to describe the presentation of a document written in a markup language. It saves a lot of work by controlling the layout of multiple webpages all at once. Along with HTML and XHTML, the Cascading Stye Sheets can be applied to any XML document such as XUL, SVG, XML, and one can use it to render speech or other media. In most cases, browser support for CSS has never been a concern once you learn CSS. However, it’s is quite difficult for designers to remember all CSS properties and values. To address this issue and increase productivity, most developers use cheat sheets. They are just a quick reference that helps you double check the snippet of code you’ve doubts about. To make your life easier, we are presenting some of the most useful CSS cheat sheets that will definitely help you get all the necessary elements at a glance. Since they all are freely available, you don’t need to pay anything. This is a brief cheat sheet divided into 3 sections – layout mechanics, centering elements and common code. It is available on a single webpage in HTML format. The thing that makes WordPress so popular is its customizability. It lets you target very specific aspects of your website with CSS. On this page, you will find WordPress cheat sheet for default body class styles, post, format, menu, widget, common form and WISIWYG editor style. This webpage includes transforms, transitions, animations, filters and target. All properties are well-described along with their syntax. If you are interested, you can learn several interactions methods and triggering animations and transitions with those interactions. If you are looking for descriptions and notes of important CSS properties and values, look no further than simple infographics of CSS_properties provided by genautica. CSS click chart provides dozens on example code to manipulate your elements, for example code for box sizing, adding text shadow, keyframe animations, gradients, transforms and much more. It also gives you live demonstration and browser support information. As the name suggests, its an ultimate CSS grid cheat sheet that allows you to draw (for testing purpose) any number of grids (both columns and rows) of any size. The CSS3 cheat sheet for media query that contains the code for phone, tablet and desktop, with orientation. The Flexbox Layout (flexible box) module offers a more efficient way to lay out, align and distribute space among items present in a container, even if their size is dynamic or not known. This page gives a detail on how to implement these flexible boxes. A very brief cheat sheet that shows the parameters of commonly used properties such as border, font, background, example, color, and more. It is available in JPEF format only. This cheatsheet is packed with detailed information about different CSS modules, including attributes, pseudoclasses, fonts, colors, composition, filter, effects, transitions, animations, transformations, positioning, alignment, and more. It’s available in PDF format. This is a quick reference guide by Toptal. It includes some of the most important selectors, properties, units, syntax and other useful information in brief. The interactive CSS cheat sheet consists of common codes that you can easily copy and paste in your project. With interactive widgets, you can generate code for styling gradient, text shadow, box, background, fonts, buttons, transform, border and more. The is a collection of preset, plug-and-play animations for your next project. To implement this, you have to add the stylesheet on your webpage and apply the predesigned CSS classes to the element you want to animate. That’s all! A printable CSS3 cheat sheet, containing all the properties, selectors types and values in the current specification of W3C. All properties are provided in a different section, available in high-resolution PDF. A quick reference guide to many features of CSS, organized alphabetically. Clicking on each element takes you to the new URL, where will you find a detailed information (along with examples) about the element you’ve clicked. This is an ultimate cheat sheet including all important CSS3 tags. It is designed as an eye-catching infographics that is available in both PNG and PDF format. This a long, detailed CSS cheat sheet of total 29 pages, available in PDF and PNG format. You can treat it as a small book that comes with a neat table of content. All elements like backgrounds, fonts, texts, grid positioning, etc. are organized into different chapters to provide better readability. More and more educators are discovering the importance of having their students build some form of digital presence. Blogging is an excellent way for students to create their own online space, but what do you call this? When I first started teaching in 2004, each of my grade one/two students had a scrapbook where they would paste their work samples each term. The goals of this process were: documentation, reflection, assessment and sharing with parents. Often the same goals apply to the online equivalent of this scrapbook. But if we aren’t doing things any differently than 10-15 years ago, why are we bothering with student blogs? Why aren’t we still cutting and pasting in a scrapbook? When blogs are used as more than substitution, they offer many advantages. Research tells us that student work is of a higher quality when it involves an authentic audience. The opportunity for feedback and discussion through an online presence is greater. There are many skills to do with writing online, using technology, understanding digital citizenship etc. that are not only useful for students to know, but required in most curriculum standards. Influencing your own digital footprints from a young age can be a powerful experience. This post explores a range of approaches to student blogs and digital portfolios. We have included classroom examples, and encourage you to share your approach to student blogging in the comment section. When To Set Up Student Blogs? When I first started blogging in 2008, I didn’t really know what sort of blogging framework would work for me, but along the way I came up with a model that suited the age of the students, our combined experience, our objectives and our equipment. I established a class blog and wrote the posts, while teaching the students to write quality comments. As students became more familiar with blogging, some students start publishing guest posts on the class blog and learned posting skills. When I was teaching grade two, had limited computers and was new to student blogging, I didn’t think it was practical for all students to have have blogs. Instead, certain students who had demonstrated enthusiasm, parent support and blogging skills, earned their own blog. This added a new layer to the skill set of commenting and posting: maintaining a blog. When I was teaching grade four, had a one to one netbook program and had experience managing student blogs, I set up blogs for all students, as digital portfolios. Throughout all four stages, quality commenting and parent participation is taught and encouraged. Many teachers begin their blogging journey with a class blog and perhaps progress from there. However, you can jump in at any point of this framework. You might only be comfortable with having a class blog initially. There is certainly nothing wrong with this approach, although keep in mind that aiming to have more student involvement at some point in the future can be advantageous. At the other end of the spectrum, you might have the confidence, experience and equipment to set up student blogs from day one. Go for it! Whatever your approach, a class blog always complements a student blogging program. It provides a home base where you can post assignments, showcase student work, publish recounts, communicate to parents, establish community/global connections and more. We have many resources in our Edublogs Help Guides that will walk you through the process of setting up student blogs. Sue Waters’ five step guide to setting up student blogs is a good starting place. Install a widget to the sidebar of your class blog and student blogs which links to all the student blogs in your class. This means students and readers can easily visit all the blogs, without searching, bookmarking, or adding links individually. Many educators refer to their student blogs as digital portfolios. Academics and thought leaders often debate the meaning of the term digital portfolio. What does this mean? What does it look like? 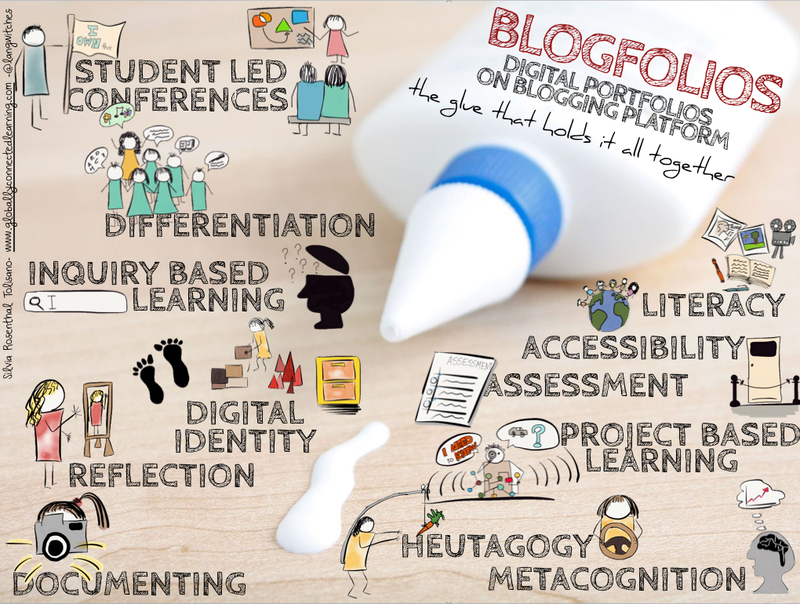 Perhaps an useful alternative term is ‘blogfolio’ which Silvia Tolisana describes as the glue that can hold it all together in learning. Blogfolios are the glue that can hold all curricular content, goals and objectives as well as support school initiatives, observations, assessment and accountability requirements or personal passions, interest and projects together. For the purpose of this post, we are less concerned with semantics and more concerned with exploring the different frameworks that teachers adopt. Hopefully considering how other teachers approach student blogs will give you some ideas on what would work for you and your students. Let’s break these down and consider where you might sit on each spectrum. Some student blogs are only active for a year. The student might move up to a non-blogging class and their individual blog remains stagnant. This can be frustrating for teachers who invest time in establishing an effective system for their student blogs. It can also be disappointing for students. Other institutions think ahead with a whole-school approach. At The Geelong College, which operates their own Edublogs CampusPress platform, there are long term plans. …each student from Year 4 to Year 10 at our College will have a digital portfolio that follows them throughout their time at the College and has a unique identifier accessible on the web. Consider: If you’re investing time in establishing student blogs, how can you showcase this to the wider school community and motivate them to establish a school wide plan? Should blogs be public or private? This is always a contentious issue. If you hide student work behind passwords, then you might as well have them print everything out and hand it in the old-fashioned way. You are losing out on connections, extended dialogues, and the motivating factor of working for an authentic purpose. In the comment section, there were some well considered opposing views. Try to imagine that every stammering oral presentation, every 5th grade writing sample and every stick finger drawing you ever made in a classroom was permanently posted online, forever. As a teacher how would you feel if your class of iPad toting students were surfing through your complete “virtual portfolio” while you were trying to assign them an essay? … Blogging is great but this new information era needs educators who fully appreciate the long term consequences of posting everything publicly. There is a middle ground. At The Geelong College, students are encouraged to decide for themselves whether their blogs will be public or password protected. Another option is to create a public blog but password protect certain posts or pages. Consider: What are the pros and cons of having student blogs as public? Some schools seem to default to the private option if in doubt. Does this mean you’re giving up all the powerful advantages of posting publicly? What will form the content of your student blogs? What will they actually publish? At one end of the spectrum is total freedom where teachers are less concerned about what the students are writing about, and more concerned about the students simply blogging and finding a voice. At the other end of the spectrum, some teachers see the blogs as a space that must be in line with the curriculum and demonstrate what is happening in the classroom. Certainly not always, but sometimes the age of the students influences this issue. Mostly – the children have a free spin on what they would like to write a post about. It gives them an outlet for writing about their passions/interests, and it then gives me an “in” for feedback and improvements to their writing. She also finds this approach opens up a very wide range of possibilities to meet certain individual’s requirements. Julie understands that the students do require some explicit teaching around blogging. She finds The Student Blogging Challenge a great way to achieve this. In addition, she runs a lunchtime club and a weekly timetabled blogging session. What I have done is name all the students’ blogs with their class period prefacing the name so they appear in order on the page. Heather encourages students to comment on classmates’ blogs and set up an effective system after finding students were taking too long to find a post to comment on. I have students work in “peer blog mentor” groups. They self-select a group of 3 -5 peers and then I match their group with a group in another class. I moderate the comments so I can check for accuracy and completion before they are published. This idea touches on the additional issue of feedback. Who will provide feedback to your student bloggers? Will you set up a peer system like Heather? Or will you personally visit blogs? What are your goals for feedback? Simple encouragement and conversation? Or scaffolding to reach learning goals? All questions to consider. Can your blogging framework involve set tasks and freedom? Somewhere in the middle of the freedom/structure debate, is the approach adopted by Adam Geiman, an educator from Pennsylvania. He used the first 30% of the school year to provide structure around tasks for his fourth grade students. The students were given guidance, yet also had some freedom of choice in how they’d present set tasks. Some would do a Google Doc, while others would present their task as a comic, infographic etc. For the remaining 70% of the school year, students were given more freedom and many came up with their own ideas on what they wanted to publish. For example, Jackson announced the new school trout, while Brooklyn talked about her new glasses. Consider: What are the needs of your students? Are you trying to engage them in the blogging process and help them find a voice? Or are you wanting the blogs to be a vehicle to demonstrate curriculum outcomes? Are these two things mutually exclusive? Some form of reflection is often a key feature of digital portfolios or blogfolios. If you want your students to blog effectively, give them the freedom to experiment and write about what interests them. Stay away from portfolios and forced reflections on their learning, at least until they get the hang of it. Wait until they find a voice, find an audience… before you push your agenda of meta-cognition and reflective learning. Perhaps on the other end of the spectrum is the argument from Matt Renwick in his blog post ‘Think You’re Doing Digital Portfolios? Think again’. Of course, all of the posted artifacts of student learning are accompanied with reflection, self-assessment, and goal setting for the future. Otherwise, it’s only sharing content. Nice, but not necessary for students’ education. Teacher, Lee Pregnell, from Moonee Ponds, Australia, described how they include some set tasks in their grade 5/6 blogging program. One of these tasks is a weekly 100 Word Challenge response (see student Carah’s example) and a report on a Behind the News article (see student Mariana’s report on dreaming). While the Behind the News task has some element of reflection, there are other set tasks that involve more meta-cognition. One of these is based around term goals. Check out the example by Alexis to see the format of this reflective entry. What about our youngest students? How can they reflect? Using tools like voice recordings can offer students with emerging literacy skills the chance to reflect. Kathy Cassidy is well known for providing all of her six year old students a blog. The students regularly used tools like Book Creator to document their thoughts and learning. Here is Gus reflecting on his writing. Another idea is to collate social media posts in a Storify like kindergarten teachers Aviva Dunsiger and Paula Crockett. Short student interviews and reflections offer a rich insight into learning. These innovative teachers have created a special section of their blog called ‘The Daily Shoot’. This is something Aviva has done with students from K-6. It is worth checking out. Following in her students’ footsteps, Aviva even uses a blog of her own to reflect. What a mighty combination! Consider: Most teachers agree that some sort of student reflection on learning is powerful. How can you incorporate this into your student blogs without making the process a chore or turn students off the enjoyment of blogging? Would you like your students to document their learning journeys or their best work? Will your student blogs be process portfolios, showcase portfolios or hybrid portfolios? This is a tough decision, but also one that can evolve as you go along. It also links back to the public/private debate. Do your students want every evidence of learning as part of their digital footprint? Again, there is certainly middle ground. George Couros reflects on his dilemma about what end of this spectrum he would sit on: ‘growth’ or ‘best work’. Since there are benefits in both options, it was tough to decide on one, so we ultimately went with the decision to go with both. The “blog” portion of my digital space allows me to share things that I am learning (like this article I am writing) while also aggregating my best stuff into solitary “pages”. Consider: Is George’s approach something that could be worth exploring in your own blogging program? Many of these five areas are underpinned by the question of control. Who is in control? The teacher or the students? Can there be a gradual release of control as the students become older and more experienced? Perhaps there are some aspects of their blog that even the youngest students can have some control over? Most teachers would agree that it’s important to consider how students can be in charge of their own learning. Digital portfolios and blogging offers a lot of potential for student-centered learning. The My Class tool also allows you to hand over responsibility as you choose. You can begin by moderating all student posts and comments, and then turn off these settings as appropriate. Are your student blogs igniting a passion for learning or are they just another chore to be completed? How can you set up digital portfolios or blogfolios that allow for rich learning, creativity, excitement, deep reflection, collaboration and authenticity? These are some key questions to ask yourself but in the end, sometimes you just need to throw in the canoe and start paddling. Figure it out as you go. There is a big blogging community and support behind you. Don’t let fear or indecision around student blogs freeze you into inaction. Worrying too much about whether you’re ‘doing it right’ can lead to not doing it at all. At any level, student blogs provide benefits. Embrace them. We would love to hear your ideas. Please comment and share your thoughts on student blogs. Like what you read here? Signup for our free weekly email and we will send you links related to education, blogs, and more. This is an interesting article that describes in some detail how Seesaw Activities can be a holding area for useful graphic organizers for learning & learners. These ideas have been developed by Melissa Burnell who is in her 13th year of trying to brighten the futures of her amazing learners! She’s taught in the USA for five years before moving to Dubai, then China, and now she calls South Korea home. She approaches learning with inquiry and a growth mindset. What is impressive is the ease with which these organizers are created and deployed to her students. These organizers could also be co-created based on criteria or intents developed in class. Or they could have differentiated easily enough within the Seesaw environment simply selecting a subset of students to deploy the activity too. Disclaimer: If you want to read about the WHY behind designing custom graphic organizers in my class, keep reading. I like to talk, so if you want to go straight to the instructions, scroll down! This is the first year that I have had the opportunity to guide my learners through Project Time, sometimes know as Genius Hour or Passion Project. If you are not familiar with this, Project Time is one period a week in which learners have the freedom to learn about something that speaks to them, or interests them, and probably wouldn’t appear in the usual units taught in the classroom. Maybe a students wants to know more about composing music, or harp seals, or making slime. As long as learners have a purpose in mind and are working towards their goals, it’s doable! Pretty cool if you ask me. I was eager to jump on the Project Time bandwagon at the start of the year and was happy to have some help getting started with organization thanks to Kath Murdoch’s The Power of Inquiry (a must read for any inquiry teacher!). She includes several great tools in her book to get learners on the right track to be purposeful in their personal inquiries. As Project Time got underway in my classroom, I found myself running to the photocopier more than I wanted. Two students wanted to change their project topics–go copy. Another student can’t find her daily planning sheet–go copy. And each week daily planning sheets needed to be handed out again. Plus, with learners working at their own pace, new project proposal sheets needed to be made at different times. I knew there had to be a better way to avoid this headache. My first attempt at going digital was to ask my class to hop onto Seesaw and add a quick post at the end of each Project Time period to let me know what they accomplished and what their next steps were. Not bad, but this only cut down my paperwork a little bit. I needed to do something more. When I became a Seesaw Ambassador this year, I remembered coming across a slideshow containing different graphic organizers that could be used for Seesaw. Aha! I could create my own and go completely digital! BINGO! Now I have a solution to paper waste and wasted time! The beauty is that you can custom make ANY kind of graphic organizer you want for you learners. 1.) Use Google Slides, PowerPoint, or Keynote to make your custom graphic organizer template. For mine, I used Google Slides and added lines, shapes, images, and text boxes to create the desired look. I started with a blank layout, changed the background color, and built up from there. 2.) Once your graphic organizer is made, save it as a JPEG image. 3.) Now open Seesaw. In Seesaw, choose the green add button to add a new item and choose the option to Share Activity. 4.) Choose Create New to create a custom activity for your class/group of students/individuals. 6.) Choose the option to Add File. This is where you will upload your custom graphic organizer. Choose your file from your device. 7.) After you have selected the file, click the green check button. 8.) On the next screen, you can either choose the green check button, or if you want to add further information, choose one of the options at the bottom of the screen. 9.) Next, either choose to Preview the activity or Save as Draft. 10.) Finally, choose the green Share button at the bottom of the screen. 11.) When your learners open the activity in Seesaw, they will have the option to add text anywhere on the graphic organizer and draw/write their responses. It’s that easy! If you want to use a common graphic organizer, you can search online for an image of one, save to your device, and use the same steps as above without the hassle of designing your own. If you have a resource book with graphic organizers, you can take a photo of the desired organizer, upload to your device, and again follow the steps above. I hope this helps you as much as it helped me!